HAZRAT SYED IMAM ALI SHAH R.A. The great Hazrat Aboul Barkat Imam Ali Shah was borne at Rattar Chattar in 1212 A.H. His birthplace is presently known as Makkah Sharif. His father, Syed Haider Ali Shah was a herbal physician (Tabeeb). He was yet a child when he lost the benign shelter of his father. He received his basic religious education from Moulana Faqeer Allah Din Koti and was trained in his ancestral field of medication by Hafiz Muhammad Raza and Moulana Noor Muhammad Chishti. He was very intelligent and he surpassed his fellow students in every discipline. However, from his very child-hood, he possessed a sensitive nature and was inclined towards poetry. Even during the days, when he as a student, he could compose verses with felicity and ease. 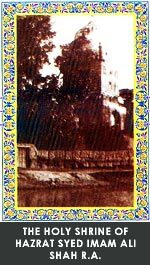 In those days when he was quite young, he happened to visit the holy shrine of Hazrat Baba Fareed Gunj-e-Shakr where he met a fortune-teller who, by dint of his knowledge of physiognomy, read the promising signs of saintlihood on the face of the young saint and predicted: "This lad will command a sublime position in future and will be favoured by an elderly person of his family." Hazrat Sahib became anxious on hearing this prophecy and tried to visualize that particular person of his family, who was destined to lead and guide him on the Divine Path. In this respect, faces of all the members of his family flashed across his mind but he could not identify that special personality. Next day Hazrat Syed Hussain Shah called him and explained to him a few verses of the "Masnavi Shrif". The words of his teacher stirred the very heart of Hazrat Ali Shah The very first lesson produced in him a great desire and urge to learn more of it. His interest rose to such a pitch that he started regular readings of the book. Whereas he proved himself a devoted student, his teacher, too, was not less devoted.The method of teaching of Hazrat Shah Sahib was superb. The manner in which he explained the difficult verses of the "Masnavi" was matchless and unique. When he spoke, the listeners were charmed and infatuated by the spell of his beautiful oration. The more Hazrat Imam Ali Shah learnt from Syed Hussain Shah the more he was inspired by his great and sublime personality. Hazrat Imam Ali Shah himself narrated that once, during his education, he had to visit Hafiz Mahood at Jehlum, along-with Hazrat Shah Sahib He witnessed strange phenomenon at the meeting of the two great personalities of that time. People from the surrounding areas were present to show their allegiance to Hafiz Sahib. Hazrat Imam Ali Shah also requested him to shower his spiritual blessings upon him. At this Hazrat Hafiz Mahmood said, "Allah will bless you with the love of your mentor". In fact, he was referring to Hazrat Syed Hussain Shah Hazrat Imam Ali Shah said: "From that day, my heart was filled with love of and affection for my mentor. When we returned, I requested my mentor to grant me asylum in his spiritual regime. He was gracious enough to accede to my humble request and admitted me to his spiritual circle. He advised me to indulge in "ZIKAR" (remembrance of Allah). Within a short span of time, by virtue of of his own diligence and hard work, and by the special attention with which his mentor treated him, he rose to such an eminence of spiritual status for which divine seekers endeavour for many years. Allah had blessed him with such miraculous powers as could purge the hearts of astray men at a single glance. He used to stay at the bank of a pond called "Dholi Dhab" for many consecutive nights. The pond was far from human habitation and was an ideal place for meditation and contemplation. He faithfully followed the routine, which his mentor had prescribed for him, throughout his life. He had a great respect for his mentor and held him in high esteem and reverence. He left no stone unturned to rise to the expectations of his mentor and served him to the best of his capacity. His love for his mentor had implanted in him a rare and special kind of humility as well. He crossed all limits in expressing this humility. He himself used to collect the excrement of his mentor as well as that of his horse in an earthen pot, carry it on his head and dispose it of into the river. This, indeed exhibited the humblest expression of his love and respect for his mentor. This is why Syed Hussain Shah had a great regard for him and held him very dear. Allah had bestowed upon him many blessings and a beam of light always sparkled on his face. Even after the demise of his mentor, Hazrat Imam Ali Shah kept the sentiment alive. A famous incident happened in his family. Once he got annoyed with his son Sahibzada Sadiq Ali Shah Sahib on some thing. All the well-wishers tried to resolve the matter but in vain. At last the Sahibzada made a request to God at the tomb of Hazrat Syed Hussain Shah in the following manner: "If a father gets annoyed with a son, the latter has no place in the whole world to resort to. My father is not only my parent but also my spiritual guide. For God's sake, help me in my predicament and helplessness". When Hazrat Imam Ali Shah learnt of it, he called his son and asked. "What appeal have you made to Hazrat Hussain Shah ?. The Sahibzada replied, "The secret is open to you". Hazrat Imam Ali Shah , at once mellowed down and said." Since you have approached the higher court, I forgive you". Emphasizing the respect of mentor he said: "A 'Mureed' (follower) must cherish respect from his mentor to such a degree that, so long as he is present in his company, he should not speak without his permission; should not daringly make an eye to eye contact with him. He should prefer his mentor to all other things in the world. "Treeqat" is, in fact, just another name for respect. A disrespectful person remains deprived of the blessings of his world as well as those of the hereafter". At another point he said: "Be all ears to listen to what your mentor says because to hear his advice is better than to read thousands of books. Perform whole-heartedly what your mentor enjoins you to do." Defining the word, 'Mureed' (disciple) he said; "A 'Mureed' is one whose carnal of desires have been burnt down by the fire of Divine Love. When he gets up in the morning, tears flow from his eyes on account of sorrow and regret at the life he has wasted. He is humble and un-resourceful. He feels sad at his past sins and aspires for Divine favour in future. He is time-bound for deeds upright and bears all hardships with patience. He always confesses his fault and is a candidate for the forgiveness of Allah. He does not waste away even a single breath without remembering Allah; rather at every breath, he thinks that he is taking his last breath". Regarding spiritual benefits he said: "The bounties and blessings that descend upon a mentor also descend upon the follower, but a follower can not get benefit directly from the Divine Court because four basic elements of his existence and his carnal desires obstruct his exaltation. Since a mentor is free from these shackles, and remains attached to Allah Almighty; therefore a follower can also get benefit from his mentor." He further said: "Repent is such a manner that you may never think of committing a any sin again". Describing the merits of 'ZIKR' "There are innumerable benefits of "ZIKR'. The heart of a person, who remembers Allah and remains busy in 'ZIKR', leaves no space in it for any other thing except Allah. That is why every object in this world is in his control". Talking of Spiritual maladies, he said: "Allah Almighty disapproves that the followers of the beloved Prophet Sallalaho Alyhe Waslam may be condemned in any way (as earlier people were condemned). However, those, who do not fear or do not obey Allah are condemned for they blacken their hearts and do not refrain from sin'. He advised his followers that they should never become idle. They should always remain busy in work and contented with their lot, and cherish the belief that God is the Sustainer and that He alone provides food to His creatures under all circumstances. However, it is impossible to get more than their due share. Therefore they should not disobey Almighty Allah by making complaints because disobedience causes damage in this world as well as in the hereafter. Allah Almighty had especially blessed and gifted Hazrat Imam Ali Shah with two great qualities which he had acquired by dint of his great obedience to the Holy Prophet Sallalaho Alyhe Wasalam. One of the quality was his healing look and the other one was his brilliant fact. Many non-Muslims embraced Islam at his hands and many misled Muslims reformed themselves and got the real spirit of the Faith. Such was a little show of the stupendous miraculous powers he possessed. It is that sick people got rid of their illness at his hands. Once a Sikh, who was a chronic patient of paralysis was brought for Hazrat Sahib. As soon as the patient had a look at the glowing face of the great saint he got up, embraced Islam, remained in his company throughout his life as a servant. It is stated that even in the season of winter, the said person used cold drinks in order to keep himself normal. He used to say: "Since the day Hazrat Sahib has cast his benign and kind glance at me, nothing soothes me down except cold drinks. It seems as if my whole body is on fire". Many lepers got rid of their disease by applying to their bodies, the wasted water used by him for ablution. Once a man brought his only son, who was blind, to Hazrat Sahib and requested him to help the boy, Hazrat Sahib put a little saliva into the eyes of the blind boy and prayed for him. In a couple of visits, the eyesight of the blind boy was restored. All material things that exist in this world impress the human heats very much and the impression is like a screen or veil between man and his Master. This impression gets deeper into the heart of man by adopting bad company, by seeing colorful shapes of different things and by indulging in idle pursuits. Therefore, to wipe out this impression, man should strive to get away from them. The other thing that strengthens this impression is the study of immoral books and man's participation in musical gatherings and idle talks. All these things widen the distance between man and Allah Almighty. It is, therefore, necessary to shun them and to become attentive towards Allah. Only then man can get his heart purified. The purification of the heart can not be achieved without giving up carnal desires and without negating physical demands." At another place he says: "Let it be known to man that the real comfort lies in heaven. So, he should bear the hardships of this world where his stay is only for a few days so that he may find eternal peace and comfort in the next world. In all cases, whatsoever, he should follow the examples set by his forefathers in religion. He should always offer his regular prayers in congregation (JAMAT) and acquire the knowledge of Hadith. He should not run after popularity and worldly fame as these things cause a great trouble. He should not be proud of having a high rank; rather should spend his days in anonymity." In his last days Hazrat Sahib fell ill. He breathed his last on 14th Shawal 1282 A.H. and embarked on his way to heaven. He was buried at Ratat Chatar (Makan Sharif India). He is spiritually alive till today and his valuable teachings will remain a source of guidance for the seekers of truth for all times to come. After his demise his son, Sahibzada Sadiq Ali Shah, succeeded him. Note: Above matter extracted from Sher-e-Rabbani Digest. The original name of Makan sharief was ''Rattar Chattar''.It was located on a high mound on the left bank of river Ravi.It was the governing seat of a Hindu Raja named Chattar Dhari.May be Dhari Chand, and Chattar(The RoyalUmbrella)under which his throne was kept.So he was famous by the name of Chattar Dhari. Chattar Dhari was an orthodox Hindu, deadly against Muslims.Hindu jogies had also an ASTHAN here.A story goes like this,"That the muslims failing to pay the "Turukshka danda" were made to drip their blood(Ratt in local language)on his umbrella(Chattar in local language).Thus the place came to be known as "Rattar Chattar". Hazrat Daniyal,who was resident of Samra Iraq and a decendent of Imam ALI Naqi in his 18th generation was at Madina Tul Rasool(peace be upon him and his progenies)after performing many Hajj at Makka. H e had a devine revelation there to go to India and preach Islam.He landed at the port of SURAT,went to Ajmair Sharief on the shrine of Vali e Hind Hazrat Moeen ul Din Chishti and form there to Delhi.There was great disturbance.Syed dynasty was ruling Delhi,Mubarik Shah(1421_1432)and Mohammad Shah (1434-1445). .At Delhi Hazrat Daniyal met Syed Masood and married his daughter from whome he had three sons named Syed Ghafoor, Syed Taifoor,and Syed Kawaja. Hazrat Shah Madaar Badeeh ul Din was in this area(RattarChattar)preaching Islam ,but was mostly in a state of "SUKAR"( Devine Intoxication). He had a reveltion to leave this place in the year 836 AH,=1432 AD.and go to Delhi.As he left, there was a devastating flood in The River Ravi which washed away the entire place. Hazrat Shah Madaar Badeeh ul Din (in the year 836 A.H.) directed him to go to Rattar Chattar, explaining all the topography of the area.Hazrat Daniyal migrated to this place along with his youngest son Syed Khawaja,preached Islam under very hostile conditions and died on 9th Rabi ul Awal 896 A.H.corresponding to 20th January 1491 during the reign of Sikander Lodhi(1489-1517) . Syed khawaja continued his mission and died during 984 A.H.(1576 A.D.)and is burried by his father's side.Syed khawaja was followed by his son Syed Abdul Maali who died during 1051 A.H.(1641)A.D. Syed Abdul Maali had four sons,Syed Arif,Syed Murtaza,Syed Malaqi and Syed Zahid.Syed Arif continued the mission and died 1103 A.H.(1691 A.D.)and is burried in the same compound as Hazrat Daniyal. Syed Arif had five sons from two wives,Syed Jan Ali and Syed Sadiq Ali from one and Syed Shah Mohammad ,Syed Saleh and the fifth name is not known from the second.There were property disputes in the family and step brothers separated. Syed Shah Mohammad had five sons, Syed Karam Karim, looked after the visitors and "mureedeens"Syed Lutf Karim looked after the estate,armoury,day to day affairs and dealing with State Officials,Rajas and chieftains,Syed Shah Karim ,joined the Kings Force as an officer, Syed Mir Karim looked after religious affairs and Syed Fazal Kareem served his father and devoted to prayers. Adina Baig khan, the Faujdar of Jalandhar was a very cruel person,.He was after one Nidhan Sing a chieftain or Masildar of the area.Afraid of Adina Baig's revenge, Nidhan Sing left the area and took refuge at Lahore.People of the area approached Syed Shah Mohammad and pressed him to help Nidhan Singh and call him back.Syed Shah Mohammad wrote to Nidhan Singh accordingly, but the messenger was intercepted by the intelegence of Adina Baig.Syed Shah Mohammad was arrested, jailed and sentenced to be blown by the howitzer.Out of a miracle, Adina Baig was convinced about the wisdom and piety of Syed Shah Mohammad,freed him and also rewarded him.Muin ul Mulk "Mir Munno" was the Subedar at Lahore. waqif e dard e ghareeban Shah Mohammad parsa. Syed Shah Mohammad died on 10th Zil Qadeh 1180 AH,Thursday 9th April 1767 A.D.
Syed Shah Karim s/o Syed Shah Mohammad is burried in Bhiri Shah Rahman(Ilaqa Bar Loyalpur now Faisalabad).He had two sons,Hussain Ali(BHORAY WALEY SAHIB SYED HUSSAIN SHAH R.A.) and Mohsin Ali, and two daughters Noor Bakht and Nek Bakht.Noor Bakht was married to one of the syeds of Alipur Syedan dist Sialkot.She had two sons Syed Chiragh Shah and Syed Karim Shah.SYED JAMAATALI SHAH sahib R.A.was the son of Syed Karim Shah. Syed Lutf Karims/o Syed Shah Mohammad,who died in 1186 AH had two sons,Syed Nazar Ali and Syed Farzand Ali,Syed Farzand ALI had two sons Syed Haider Ali(Hakeem e haziq) and Syed Syed Murad Ali.Syed Haider ALI had two sons, Syed Imam Ali Shah(ROZA SHARIEF WALEY)and Syed Ghulam Ali Shah. HAZRAT SYED HUSSAIN ALI (best known as)HAZRAT SYED HAJI""SHAH HUSSAIN sarmast BHORAY WALEY SAHIB because his tomb is nearly undeground,much lower than the ROZA SHARIEF. HAZRAT IMAM AI SHAH SAHIB R.A. was the great grandson of Syed Shah Mohammad and was born during 1212 A.H.Most of his life passed with Hazrat Shah Hssain R.A.and had spirtual guidence from him till he was awarded the spirtual heritage by his SHEIKH Hazrat Shah Hussian .Islam spread in this area due to the effort of these SAINTS.Rjas of Rehlu "Kangra velly" were their followers(mureeds).Mirza Mohammad Nawab khan offered his daughter to Hazrat Imam Ali Shah and Mirza Mohammad Yahya Khan offered his daughter to Syed Sadiq Ali Shah s/o Hazrat Imam Ali Shah in 1855 A.D.
Hazrat Imam Ali Shah died on 13th of Shawaal ul Mukarram 1282 A.H.Thursday the 6th March 1866 and was burried in his hujra.The towering sharine ROZA SHARIEF which is still visible from Pakistan side of the border on River Ravi near Narowal was constructed by Hazrat Sadiq Ali Shah sahib. Fifty of his "khualafa"(spirtual descendents) are named in his narrations" AAYAT e QAYUMIYA compiled by Syed Ahmed Ali sahib Dharamkoti. Hazrat Imam Ali Shah was followed by his son Syed Sadiq Ali Shah shib who was born in 1250A.H. (10th of May 1834 AD. and died on 21st Rajab ul Marajab 1317 A.H. Friday 24 November 1899 and is burried in Rozasharief. Hazrat Mir Barak Allah s/o Syed Sadiq Ali Shah followed him after his death.He was born during the year 1275A.H. (1859 A.D.) and served the cause of invitation to the peaceful religion of ISLAM for twenty years and died on Sunday the 20th of Muharram ul Haram 1337 A.H.(27th October 1918 A.D. In Rozasharief the towering sharine, rest the Saints(Vali Allah)1)Hazrat Imam Ali Shah Sahib,R.A. (2)Hazrat Sadiq Ali Shah Sahib R.A.(3)Hazrat Mir Lutf Ullah sahib s/o Hazrat Syed Imam Ali Shah sahib R,.A and (4)Hazrat Mir Barak A llah sahib R.A.
Hazrat Mir Mazhar ul Qayum followd his father Syed Mir Barak Allah Shah Sahib ,who died in the year...... before partition and was burried on the right hand side of the entrance door of ROZA SHARIEF. The present Sajjada Nashin is Mir Syed Hussam ul Qayum. The shrine was used as an observer's post during the Indo-Pak wars of 1965 and 1971 by the Indian army and was shelled. The mortars pierced the shrine walls at different places damaging the structure and some live mortars can still be seen stuck in the walls.The big horizontal slit made for the observer post in the top dom is also visible and is adding unstability to the dom. The Masjid(mosque) had five doms and a big hall, one of the five doms has perished and the hall roof has also fallen. There was vast agricultural land dedicated(WAQAF) for the maintenance of these structures.The income of this WAQAF land is being used by the Govt: of Pakistan which is requested to endeavour in this respect. The shrine of Hazrat Shah Hussain PHORAY WALEY SAHIB is eqally in bad shape. It was all white marble, the walls of which have developed cracks. I have posted some pictures from the video with me, in the album here along with clips and can be seen.Praise goes to the man (A SIKH ELDER OF THE VILLAGE) who is devoting his efforts to keep the place as it looks. Friends are requested to guide me how we can preserve these shrines of the Saints who lived and died for the cause of ISLAM. THE PRESENT SAJJADAH NASHIN OF HAZRAT IMAM ALI SHAH SAHIB R,A. I am a Makaan Sharifi, originaly descending from Lahore in Pakistan. My father (now deceased)was born in Chah Meeran District. His name was Seyyed Ejaz Hussein Naqvi. His father's name was Seyyed Mazhar Hussein. I have one photograph of him. I also have black and white photographs from my father, of Makaan Shareef, Gurdaspur, including Imam Ali Shah Saahib's shrine, in the Indian side of The Punjab, where we originally descend from. I have my family tree, which was passed on to me from my cousin, Nadeem Naqvi of Rawalpindi, (My mother's nephew) and also have a photocopy of a book published before the partition, that states our lineage back to Hajji Daniyal of Samarra, Iraq, and then further back down to the Tenth Shi'ah Imam Ali un Naqi, (Alayhissalaam). I was born in The UK, my father migrated there in the 1960's. I have often wished to visit the shrine of my ancestors in Gurdaspur, especially the grave of Hajji Daniyal, but have yet been unable to. However, about a year ago, I managed to visit the shrine of 'his' great grandfather, Imam Ali un Naqi, in Samarra, Iraq. This shrine, not too long before, had been bombed by Wahhabi extremists. It is still under construction. Most of the pilgrims were from other areas of Iraq, Iran and the other world. I cried my eyes out when I entered The Shrine. Later, in the courtyard, I sat after saying my prayers, and questioned a gentleman sitting next to me. 'Ahaza anta min Samarra, akhi'? I asked if he was originally from Samarra, hoping that he may have some knowledge of The Locals. Perhaps they were some who shared their lineage with me, via Hajji Daniyal. 'No', he replied. He was from Kuwait. As my vision gazed over the shattered ruins to the entrance to that holy shrine, I cried some more. Mr.Syed, wish you had recorded your email to enable me to contact you.However, please see this blog of mine''makansharief-rattarchattar.blogspot.com'' and contact me on my email address'bergazeda@yahoo.co.uk.You are the grand son of '' Baba ji Mazhar and I have the honour to see him and attend his burial rituals. HISTORY:- June the 3rd 1947,Lord Louis Mountbeton,the viceroy of India announces the independence plan and the partition of the sub-continent. affected.Millions of people are massacred.Corpses are rotting in the open. There is no one to dispose them off. The rivers are in floods,there are torrential monsoon rains.People leaving their home to save their lives in search of a secure shelter have no such place under the sky.Trains picking up the refuge seekers drop them accross the line of divide.Train bogies have bullet marks,some bogies contain rotting corpses and severed limbs.Carvans are marching on the roads, epedemics have spread and the life goes on.Even the dogs are fed up from the human flesh.My memory can hardly wipe those impressions. Jamke Cheema is a village in Dist:-Sialkot near Daska. See the history of ‘’cheemas’’ in face book at .. http://www.facebook.com/note.php?note_id=216242145064A caravan of Sikh refugees from here leaves their homes and hearths and entrains at Pasroor Rly:- Station in a refugee train, The train drops them safely at Jassar Rly. station.From Jassar they cross the bridge on the River Ravi on foot and enter the Indain terotary. They are told about our village which was vacated a few days back.The village had already been looted and burnt. There was hardly any thing for immigrants to posses,except a few burnt roofs where they could take shelter from the monsoon rains and the scorching sun. Gurdut Singh,Vajeer Singh and Gurcharn Singh are three real brothers.The eldest Gurdut is 25 and the youngest about 20.They have long journey before them. They have nothing to rely upon except hope and their youth.Facing all sorts of hardships they put a yoke in their necks,till the land, work day and night to survive and are gradually settled,Get married and have families to bring up. Twenty years have passed since independence,agriculture has improved, modern methods are being introduced and ,Gurcharn Singh gets a fertilizer depot. Having no place to store the stock, he takes the benefit of the Shrine of Hazrat Imam Ali Shah Sahib and dumps the Urea stock here. Time passes on and Gurcharn Singh feels depressed and un able to move as a healthy person and is slowly confined to his bed.His children are small, the eldest is studying in class 5th or 6th and goes to school at Batala daily by bus. The financial condition is not so good, there is no one else to look after the family. Doctors find no apparent sighns of ailment and Gurcharn Singh goes lean and thin and is now confined to bed. A miracle has happened, Gurcharn Singh gets well and it is a news all around in the village and also in the vicinity and in the adjoining villages. People throng and congratulate Gurcharan Singh. Sant Gurcharan Singh is 85 years old and is living happily with his wife Preetam Kaur . The family is most prosperous in the area.All the six sons are well placed in European countries.They regularly visit their parents,help them in running a welfare trust with the name of SANT PRIVAR TRUST and take active part in the the prosperity and wellbeing of the people . It is a coincidence that the annual URS being held by the descendants of Hazrat Imam Ali Shah Sahib Rehmat ullah aleh at Bhulair chak no.119 dist;-NANKANA SAHIB falls on the same dates as the mela at Rattarchattar although there was no contact between these places since partition. HAZRAT KHAWAJA BAQI BILLAH R.A.